Cosmic Faery's Journal: Spring is in the Air! It's getting warmer, the birds are tweeting, and this image of the Princess of Swords is a welcoming sign that Spring is well on its way. 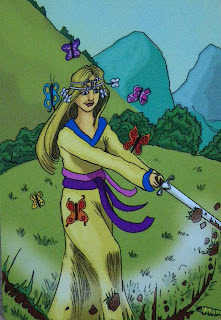 In the King's Journey Tarot the Princess of Swords is one of the prettiest I have seen. The Swords characters in a Tarot deck tend to look a little glum, strict and plain, but here we see a hippy-esque, flower-power princess surrounded by butterflies playfully wielding a sword and swirling around on a meadow in the countryside; you can even imagine her giggling away, so unlike the Princess of Swords, but for the first time I can remotely identify with her (with my sun sign in Pisces and moon sign in Cancer, I am a solid member of the Cup family... most of the time ;)). All the Princesses (or Pages in other decks) herald new beginnings, activities and experiences; here, the Princess of Swords is on a quest for new knowledge, a fact-finding mission or discovering the truth about a situation. She doesn't mince her words when she communicates with others, sometimes oblivious to social etiquette, and she may even at times lack respect and empathy for people around her. But on the other hand she seems like she's enjoying herself in this image; living for the moment and radiating confidence. Affirmation: I pursue new ideas with focus and determination. What new mental activities would benefit you at this moment in time? What changes would they bring? How would they improve your situation? What is holding you back?